completed in July 2017 and the Grand Opening event was held on September 8th. Please see The Grand Opening Program for full details on the event. WORCESTER – Rotting wood and rusted bolts at the Rainbow Child Development Center’s old play area have been replaced by brand-new playsets, thanks to the generosity of donors and a six-figure government grant. Just as important, said officials at the Edward Street-based early education and after-school center, which serves disadvantaged children in the area, the gleaming playground introduced at a ceremony on Friday will enable safer, better playtime for those kids and, in the process, hopefully help close an achievement gap separating them and their more well-off peers. Unlike many private preschool centers, however, the Rainbow Center cannot rely on its clients to pay for those initiatives. It primarily serves low-income and single-parent families living in some of the area’s poorest neighborhoods, as well as students under the care of the Massachusetts Department of Children and Families, and derives around 85 percent of its funding from the state. The problem is not unique to the Rainbow Center, according to state officials; a recent study undertaken by the Community Economic Development Assistance Corporation’s Children’s Investment Fund identified “shortcomings at many of the centers” around the state serving similar populations, said Bree Horowitz, senior project manager at the fund. In response, the state established the Early Education and Out of School Time Capital Fund Program, which has provided millions of dollars over the past three years for infrastructure improvement projects at childcare centers across Massachusetts. The Rainbow Center was among them, applying for and receiving a $200,000 grant last year. The center put that funding toward its play area project this year, which was still largely paid for through a capital campaign. The total work, costing around $750,000, required a major overhaul of the center’s rear property, including the removal of three utility poles, as well as the replacement of the old playset, which had recently been deemed unsafe for children to use. 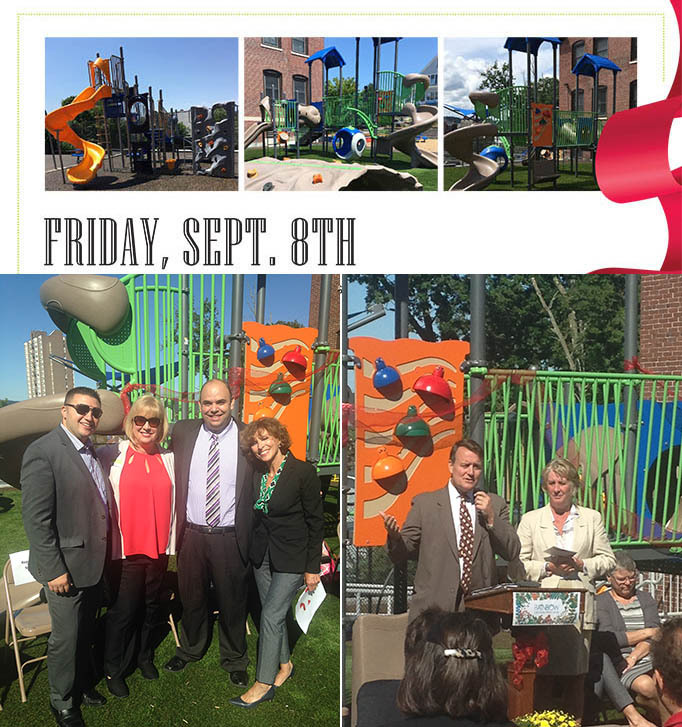 On Friday, the center unveiled the new playground, which includes a playset and other activity stations for its younger students, as well as an obstacle course for the older students who enroll in the outside-school-hours program. That philosophy extends to other areas of the center’s educational model, pointed out Nancy Thibault, its strategic communication and development manager, who said many of the students there “are victims of adverse experiences every day.” Providing them a routine, avoiding the triggers that make them upset – there’s no yelling, Ms. Thibault said – and making them feel safe are all part of the Rainbow Center’s approach. While it currently serves 250 students in total, 54 of whom are in the preschool program, “we could serve more children if we could fill additional staff (positions),” said Ms. Rowell. But like many early childhood centers, especially those dependent on government funding, the Rainbow Center struggles to attract staff, who only earn $12 to $16 an hour for a job that requires a college degree. “We put a lot of demands on our early educators – as soon as they reach the benchmarks (necessary for the job), they’re leaving to go into the public (school) systems, where the support and benefits are much higher,” said state Sen. Michael O. Moore, who spoke at Friday’s playground ceremony. “It’s a vicious cycle,” he added, one that ultimately harms students, who are most closely affected by the industry’s high staff turnover rate. Ms. Thibault said it’s taken a “team effort” from the Rainbow Center and its network of donors to build a robust financial support system for the center’s many initiatives. But when it comes to the central task of running an early childhood center, “the state does need to step up” its support as well, Ms. Rowell said.